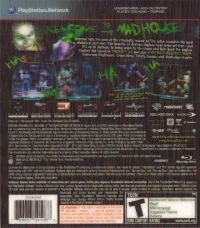 Description: Contains the full game, plus the Insane Night DLC challenge maps, the Crime Alley map, the Scarecrow platform challenge maps, and PS3 exclusive Joker challenge maps. This is a list of VGCollect users who have Batman: Arkham Asylum - Game of the Year Edition in their Collection. This is a list of VGCollect users who have Batman: Arkham Asylum - Game of the Year Edition in their Sell List. 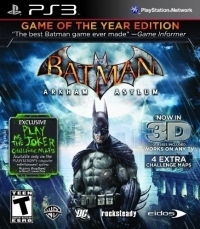 This is a list of VGCollect users who have Batman: Arkham Asylum - Game of the Year Edition in their Wish List.